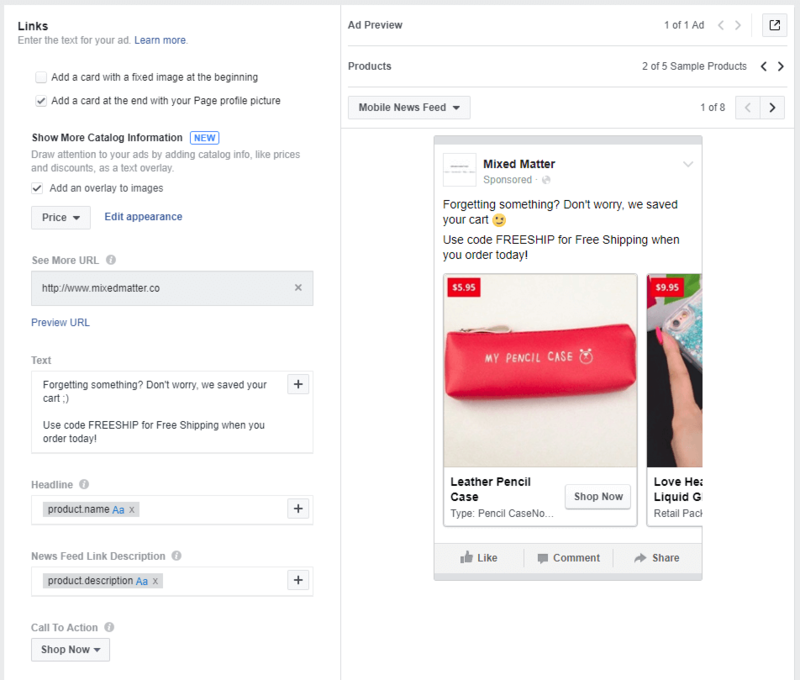 If you made it through our last post in this series – Facebook Dynamic Product Ads Part 2: Pixel & Product Feed Setup – then give yourself a pat on the back. 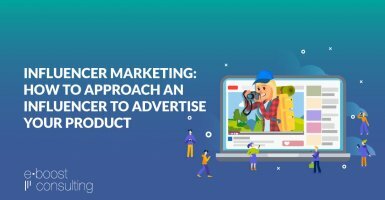 We detailed the important groundwork that needs to be in place in order to run Facebook’s powerful Dynamic Product Ads. This post outlines how to put all your hard work to use driving sales on your ecommerce site. And if you think this is just another Facebook Ads how-to guide, don’t be fooled. 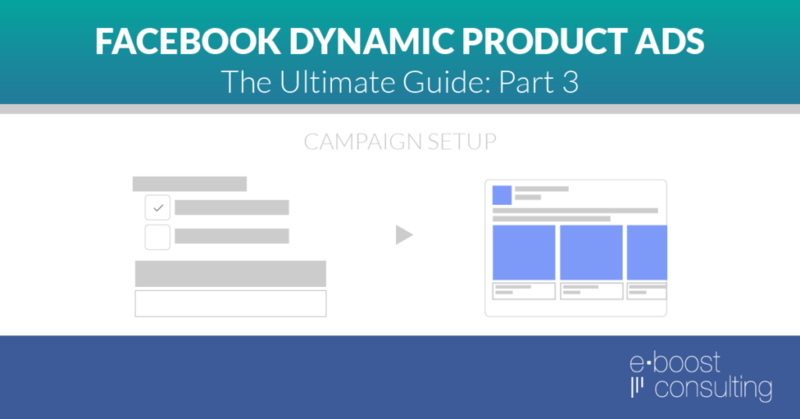 We’re going to show you how to set these campaigns up like a pro by detailing exactly how to set them up in Facebook Ads Manager, mirroring what we do for our clients in-house. Head on over to Facebook Ads Manager, select your ad account, and click the green Create Ad button in the top right hand corner. Select the product catalog you created in Part 2 of this guide and give the campaign a name. Pro Tip: I’ve included our typical naming structure below to give you an idea of how we organize our campaigns internally. Click continue and you’ll reach the Ad Set setup page. This is where you’ll identify who sees your ads, what products they see, when they see them, and where they see them. First select the products you want to advertise by selecting the appropriate product set. If your products are relatively homogeneous, you can generally advertise all products in one campaign. 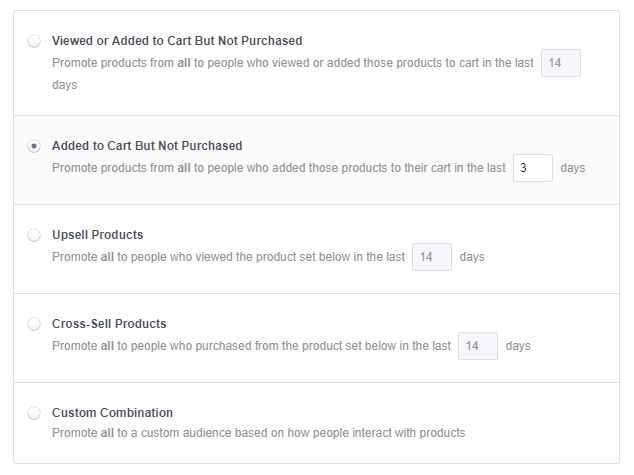 If you have specific products you want to exclude or products you’d like to separate into individual campaigns, select the appropriate Product Set or create a new one. The next step is to select your audiences. Your mileage may vary based on the intricacies of your products and customers, but this is our recommended structure and generally a good starting point for new dynamic retargeting campaigns. 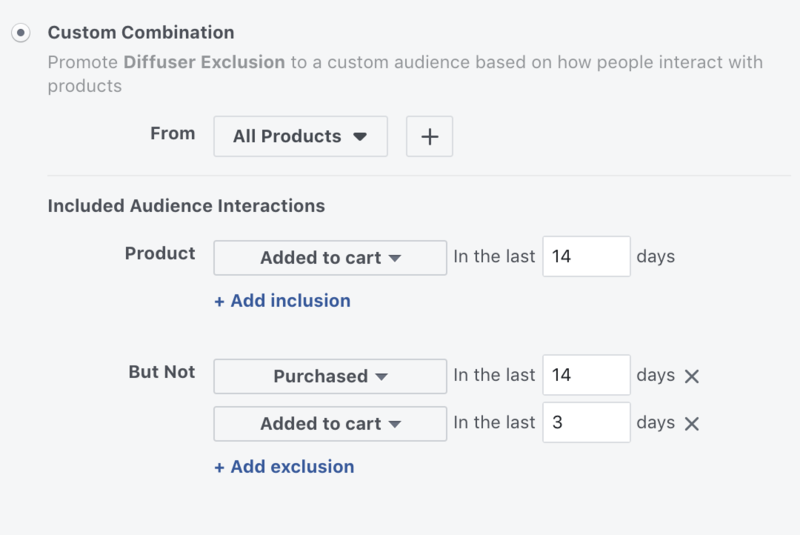 You may notice at this point that Facebook has options for the Add To Cart audiences, but not for the Product Page Views audiences. Now click the ‘Show Advanced Options’ link at the bottom of the audience selection box. This gives you all the ‘native’ targeting features in Facebook – demographics, custom audiences, interests, etc. We typically leave these relatively broad because we want to retarget everyone who lands in the buckets outlined above. Pro Tip: The one feature we do tend to use is the geographic targeting option – if a client has specific offer codes that only apply to certain countries, we’ll separate the campaigns into one US campaign and one non-US campaign. This often comes up when we’re running a free shipping promo in the ad copy. 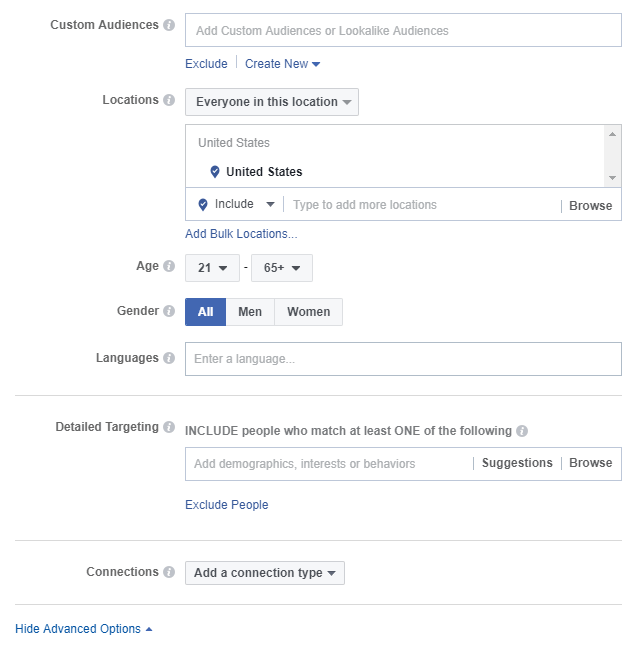 The other advanced targeting option to keep in mind is the age targeting – often there are products that can only be served to Facebook users over the age of 18 or 21 so be aware of that when setting up campaigns. Here’s a link to Facebook’s Ad Policies for more info. The next step is the placements selection – we typically run Automatic Placements (all placements) and then evaluate performance by placement once the campaigns are live to see if there are any manual optimizations we can make by excluding certain placements. 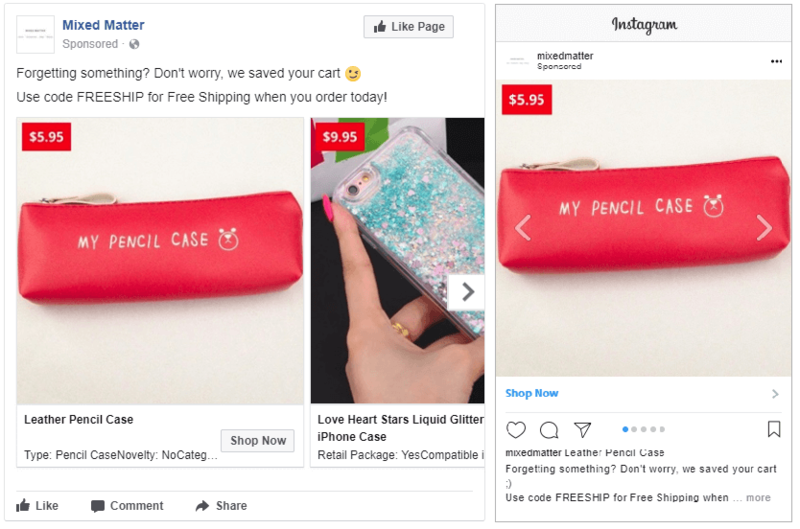 Pro Tip: Keep in mind that Automatic Placements includes Instagram and the Facebook Audience Network, so make sure your ads look good in both of those formats. Once you have your placements selected, scroll down to the Budget and Schedule section. The first step in this section is to set your budget. What do you want to spend on this specific ad set? Set the ad set budget to whatever you’d like to spend on a daily basis and use the Daily Budget option as opposed to the Lifetime Budget option. We recommend setting it relatively high because what the ad set actually spends will depend on your website traffic and the bids you set. Best to optimize the traffic through your bids and not cap the budget if the ad set is performing. The next option you’ll see is the schedule. Unless you have a compelling reason to only run ads during certain hours of the day, we recommend running your ads continuously. The downside to setting a schedule is that it can negatively impact performance when Facebook is constantly starting & stopping your campaign. Pro Tip: If you do need to set a schedule, use lifetime budgets instead of daily budgets. The next section is where you’ll set your bids. Pay close attention here as there are quite a few options that can make or break your campaign. We generally recommend optimizing for Conversion Events as this typically yields the highest return on ad spend (ROAS). Pro Tip: If you’re unsure how many conversions you will get on a weekly basis or if you expect very few clicks on your ads, try optimizing for link clicks first as this will give Facebook more data on which to optimize your ads. The next option is the conversion window – 1 day or 7 days. This tells Facebook whether to optimize based on people who convert within 1 day of seeing your ad vs 7 days. We typically go with 7 days unless it is a high-volume account as it gives Facebook more data points to use in optimization. Next you select the Event Type to optimize toward. 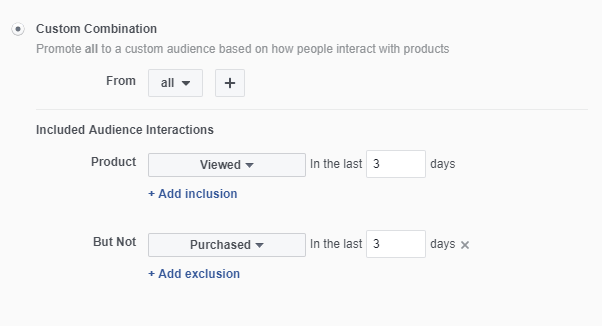 Do you want Facebook to optimize toward Add To Carts, Checkout Initiations, Purchases, or something else? We usually optimize toward Purchases unless we’re working on a very low-volume account. Pro Tip: You want to have at least 25 conversions per week per ad set for your selected Event Type. 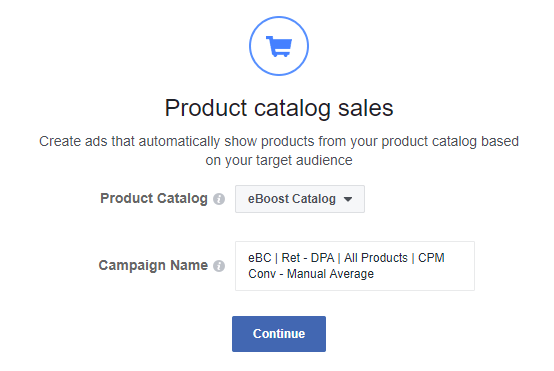 This means that if you get only 15 sales per week, you may want to choose Add To Cart as the Event Type because you’ll have more conversions there and it gives Facebook more data to use in optimization. The last option to set here is the Bid Amount. This is another important area as the setting here will have a big impact on performance. You can choose either Automatic or Manual bids. 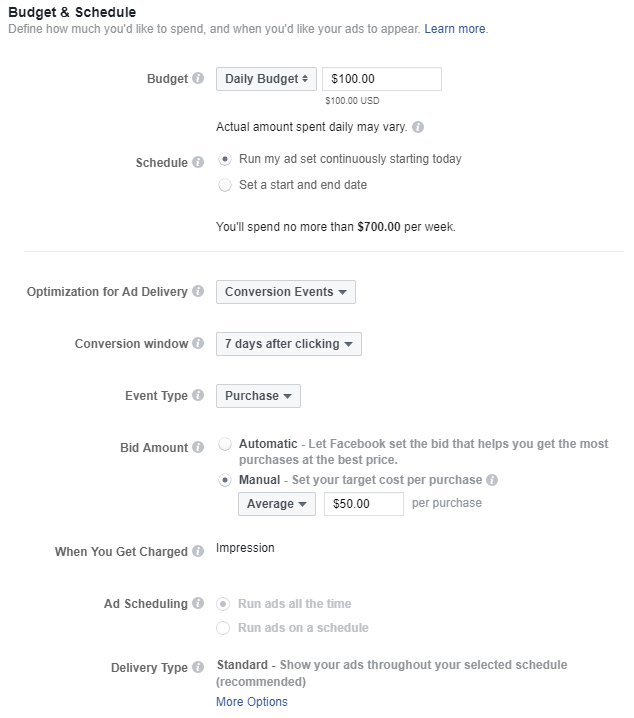 Manual let’s you tell Facebook exactly what you’d like to pay per event. We typically start with Automatic bids in order to ensure ad delivery (we don’t want to limit a new campaign with a bid that’s too low) and then we switch to Manual Bids once we have an established CPA. Pro Tip: When you use manual bids, we recommend bidding 2x your goal CPA. So if you want to pay up to $25 per purchase, set a bid of $50. If your CPAs come in too high, you can always walk the bid down slowly to control costs. See our screenshot below for the recommended budget and bid settings, then click Continue in Ads Manager to go to the Ad Template Creation section. This is the fun part! In this section you’ll set up the dynamic ad template that will pull in the product images and details from your feed. First select your Facebook page and Instagram account to use in your ads. Next you’ll select the Ad Format – Carousel (multiple products per ad) or Single Image (one product per ad). Pro Tip: Test both ad formats as separate ads. We typically find that the Single Image format works best for cart abandoners and the Carousel format works better for users higher up the purchase funnel. After selecting your ad format it’s time to set up your ad template. This is where the true power of personalization comes through in the dynamic ads. Instead of having static copy and images, you can pull in fields from your feed so the image and copy are dynamically personalized to each user. Take a look at the screenshot below for an example. For the text field, we recommend specifically calling out the fact that the user was on your site and left – it makes the ad that much more relevant to the person by addressing that fact. We also recommend including an offer code – give the person a compelling reason to come back and complete their purchase by offering a discount and stressing the urgency. For the Headline we typically use the product name and for the News Feed Link Description we typically pull in the product description. Pro Tip: We’ve found through extensive testing that including the product price in your dynamic retargeting ads increases ROAS. Your results may vary but we recommend testing it. Once you have your ad formatted the way you like it, take a look at the platform specific screenshots – you’ll want to make sure it looks good on the Desktop News Feed, Instagram, and any other placements you selected in the previous section. After confirming your ad looks good on all the placements, run through the entire setup one final time to make sure there are no errors. If all looks good, click the green Confirm button in the bottom right corner to upload the ad to Facebook for approval. The next step is to create the three additional audiences. In the previous section we set up one of the four recommended audiences. In this section we’ll set up the remaining three audiences. The first step is to locate your new campaign in Ads Manager and click to view the ad set. Once there, check the box next to your ad set and click the Duplicate Ad Set button above. Click to edit the new ad set and it will open a window with the same audience selection options from above. Simply select one of the three remaining audiences and click Save & Continue when you’re finished. Place the order for that new ad set and then repeat the process for the remaining two audiences. Keep in mind that budgets are set at the ad set level, so each time you duplicate an ad set, it’s increasing the campaign budget. 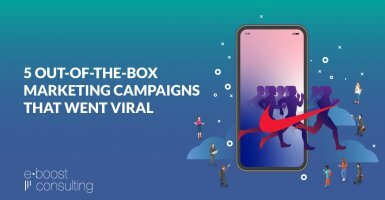 In all seriousness, give yourself another pat on the back – you made it through the entire dynamic retargeting ads setup process and created an evergreen campaign that will almost certainly drive sales for your business. 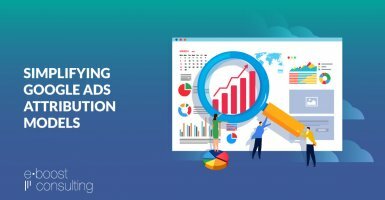 In the next post of our series we will show you how to optimize your campaign to continually improve results over time, leveraging the power of data to increase ROAS month after month after month. But for now, we’d love to hear from you about how your campaign setup is going. Leave a comment below to let us know. For a more a personalized, 1-on-1 strategy session, contact us for a consultation with one of our Facebook Ads Experts. 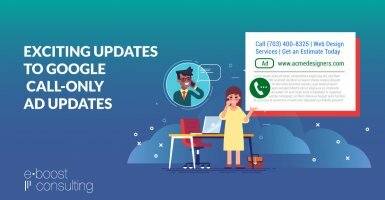 On the other hand, if this process is just leaving your head spinning and you’d rather trust an expert to manage the entire process for you, you may be a good fit for our 100% ‘done for you’ solution. Stay tuned for Part 4 of the series – Optimization and Advanced Strategies. At first look, what were written here looks complicated. But since I need to promote my money site via Facebook, I will find time to read them again and again and will apply what I’m about to learn from here! Thanks for sharing this! I never thought Facebook can be a big help in promoting anything! Thanks for this awesome guide Chris! Can you tell me how you create the ‘4-14 days’ audiences? You say “Simply select one of the three remaining audiences” but I can’t work out how to set the audience specifically for 4-14 days. There’s no ‘To’ and ‘From’ type settings and I can’t see how to use the custom combination settings to achieve this either. Are you doing it with custom audiences? If so, how do you achieve that? Hi Charles – good question, it’s a little tricky directly in Facebook (we do it all from within a 3rd party platform, Smartly.io) but here’s how you would set it up: . Try it out and let me know if it works for you. Amazing just Amazing ..!! Thank You so much for this effort. It helped tonnes, really.